5 Years ago, I burst out of my 9to5 gig at about 11:00 am. With a strange idea, a pocketful of index card notes and a vacation day, I made this. Then I modified it a million times and made the same thing, but kept the flange of the lid intact, it's a much more stable build. I've tweaked this thing many times and always returned to a similar design. 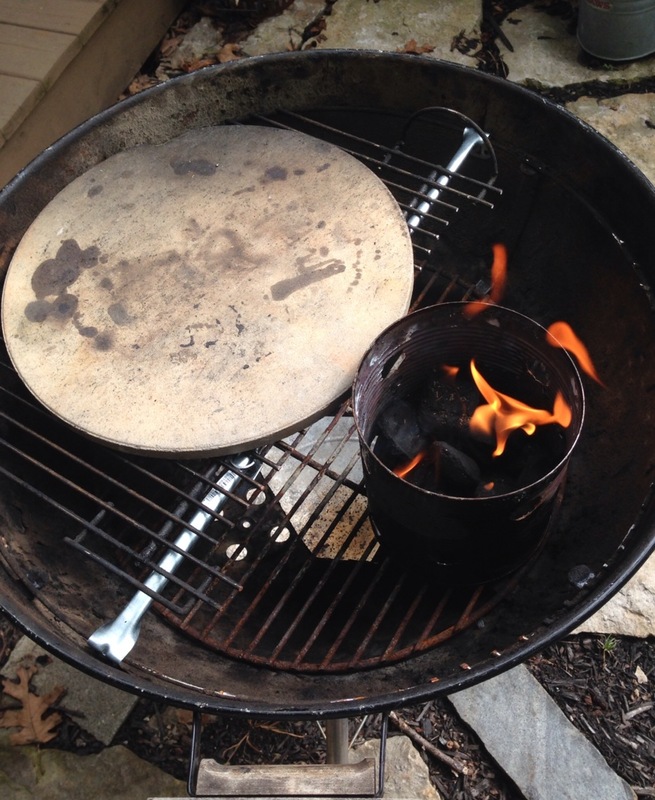 Cooking on this is not like a normal wood fired pizza oven that uses burning embers as the heat source. This uses burning wood - not just embers - to do the job. Study a bunch of ovens and you'll appreciate this difference. 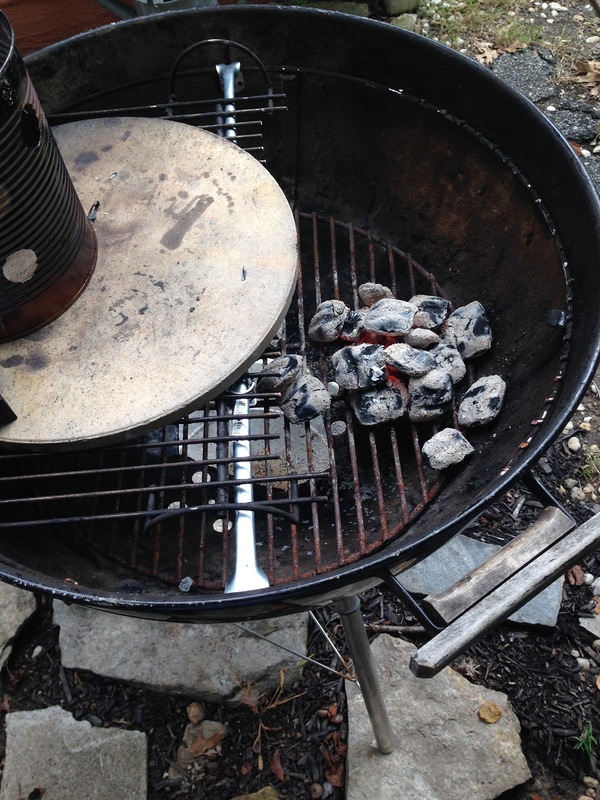 The biggest change between my modified kettle now and when it was conceived - I use hardwood and no briquettes to fire it, less ash, hotter and easier to maintain a fire by loading wood on the fly. It's not too much effort to maintain a fire for hours. After 5 years, I still get excited cooking on it. When @lleian expressed an interest in trying one out, I was ecstatic at the chance to share and offered to make one for her. She dropped off a CraigsList standard issue 22.5" kettle. 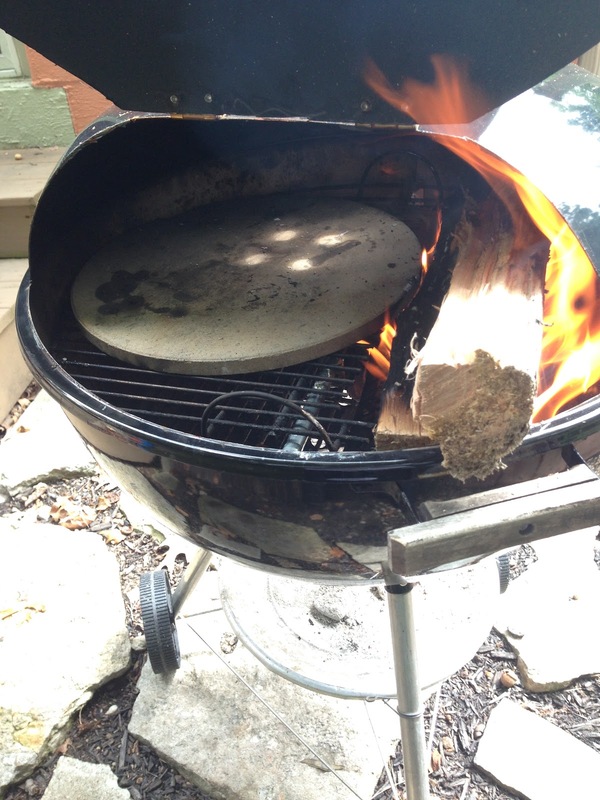 A few bucks in hardware and some blissful minutes with my angle grinder and voila, a Firedome pizza oven. Consider the following post a user's manual for a new Firedome. The new grill. 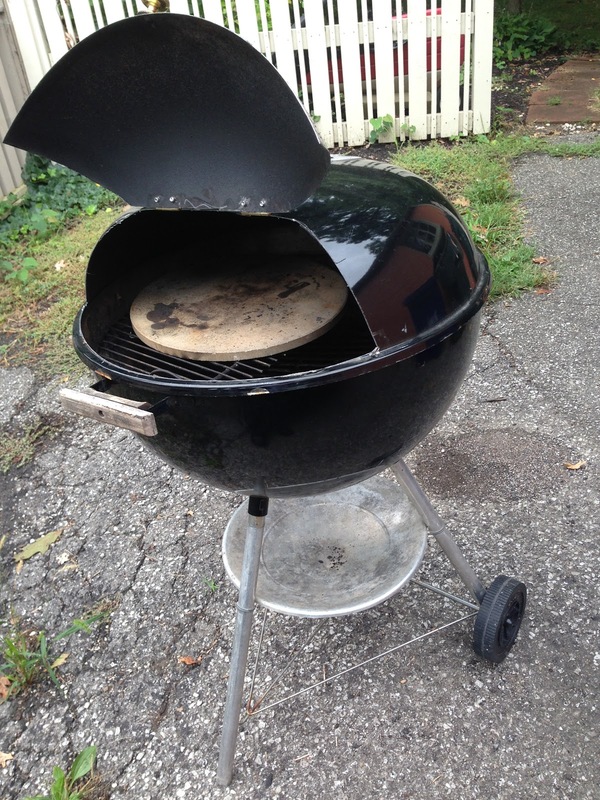 Standard 22.5"Weber kettle with a door cut into the lid (stays open for cooking) and ca. 8"diameter hole cut into the base to kick up some air flow. It's basically a starter chimney big enough to make a pizza in. Here's how to light it. 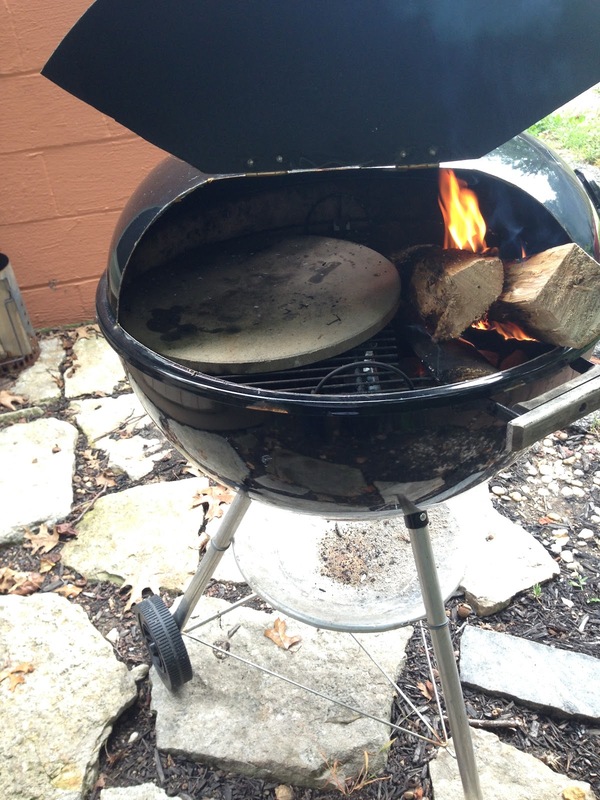 To ignite this beast, ignite a few briquettes, ca 10 or so. These will be used to start the wood. I use a chimney starter - or a large can of tomatoes with holes drilled in it. Add a few logs. I get dry hardwood at the supermarket. Two bundles will get you about 4 hours of cook time. Place the Firedome lid on with the door lid open. Keep passing in logs. Sometimes they stick out. Ideally, supermarket logs would be 3/4 the size they are, You can cut a bundle in half or let them hang out while they fire up. The best igniting bundles have smaller diameter pieces. Large logs burn slower and not as hot. Toss in logs and let things burn down for about 40 minutes. 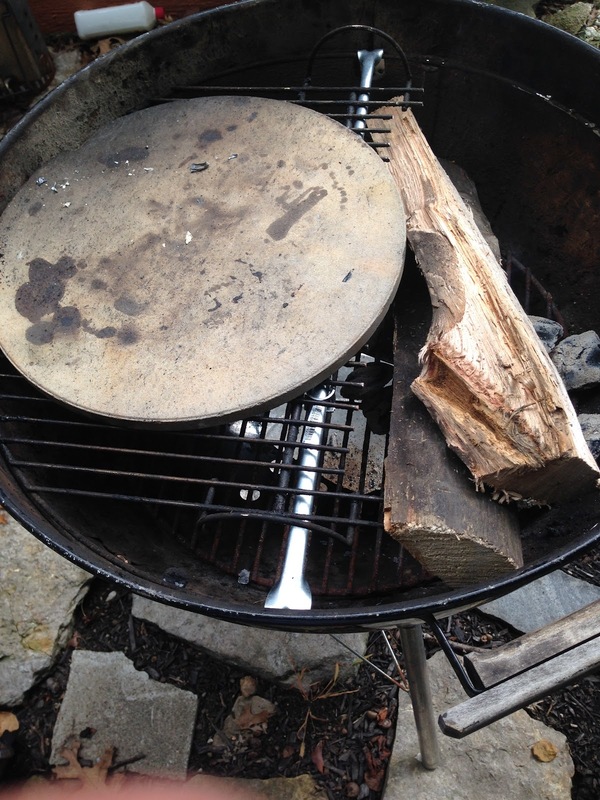 Check the surface of the pizza stone for temperature. When it's at least 600-700F you're ready. For surface measurements use an IR thermometer. 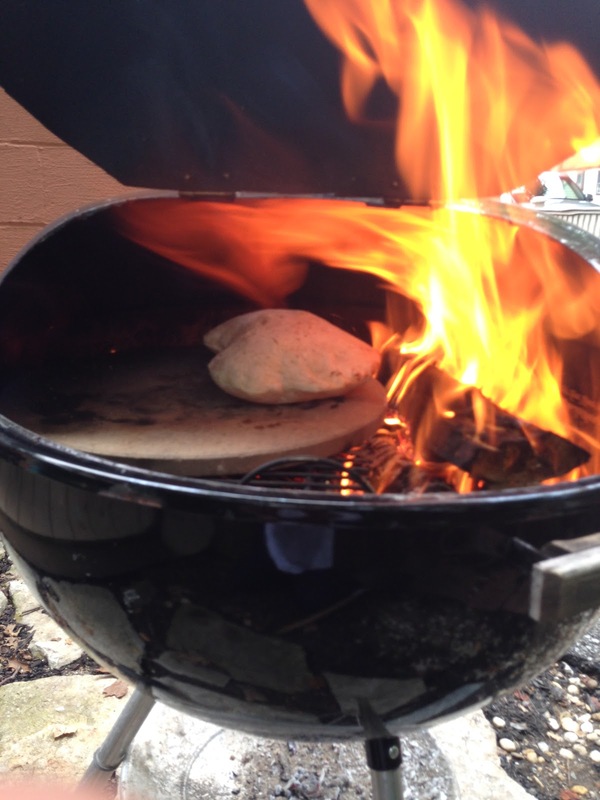 With a little practice, getting a cooking stone temperature close to 900F is possible. But 700F is a little easier to cook on. The pie should cook uniformly bottom and top. 900F is tricky, takes practice and familarity. Stone's hot, fire is cresting over, ready! Before I cook pizzas, I take a 100 g piece of dough and make a test pita. If it puffs and cooks uniformly top and bottom, it's ready. My usual pizza dough is: unbleached white flour (Montana Sapphire 600 g), water (400 g), Fleischmann's rapid rise yeast (1 pkt), salt (2t), sugar (2t), olive oil (50 g). This sits in the fridge about a day before baking. @lleian Godspeed. 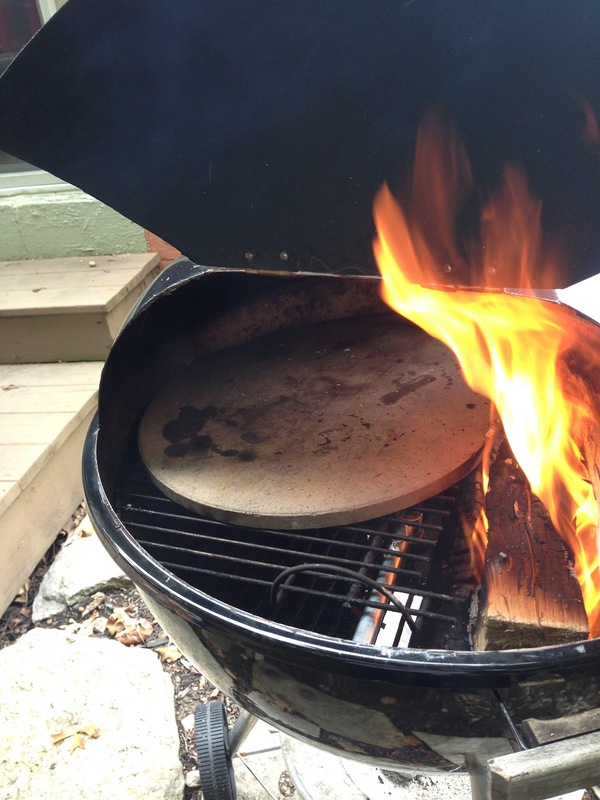 This is an insane way to cook pizza but worth it. And, thanks for the SPAM MUSUBI!! !